Thank you for revealing how the Fed’s wrong-headed rate strategy is putting my portfolio at risk again. And now, the Fed is aggressively raising rates again, hurtling the market headfirst towards another crash. So thank you, Bryan, for your Blacklist report. Thank you for revealing the four investment types most vulnerable to rapidly rising interest rates. 3 High-Yield Hogs to Exploit High-Interest Rate Markets: These three businesses go nuts in a rising rate environment, and pay out huge dividends to investors. Today, they offer yields up to 11.47% and total YTD returns as high as 17.38%. When I combine it with your Blacklist, I have everything I need to survive and thrive as the Fed screws with rates again. 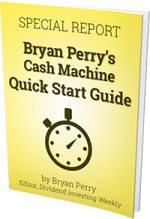 Since 2006, Bryan Perry’s monthly advisory – Cash Machine – has been among the TOP income generators for retirees. Over that time, Bryan’s recommendations have averaged a healthy 8.5% yield. That’s safe, predictable, high income… Even better, total returns since inception have averaged 10.34%. Safe Haven Portfolio: The ultimate in ultra-safe income investing. It targets dividend yields up to 5%. 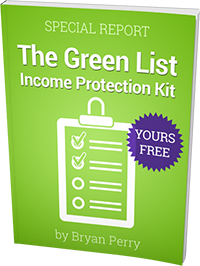 It’s a key foundation for a reliable, robust income, and the portfolio of choice for the most risk-averse investors. Conservative High-Yield Portfolio: Delivering dividends in the 6-9% range (plus share price gains), this portfolio offers higher yields for slightly more risk. Aggressive High-Yield Portfolio: Offering yields in the 10-20% range, these are the highest dividend payers Bryan recommends, but they come with the most risk of the three portfolios. Weekly “Hotline” Updates — Sent to my inbox every Tuesday, this is where Bryan gives me his latest perspectives on all open picks, and one-of-a-kind insights on the markets, the economy, global “macro” events… and more. Urgent Action Alerts — When events rock the economy, market, or our specific holdings, Bryan rushes out alerts to make sure I have the information I need to protect my money. Live, Private Webinars and Conference Calls — At least four times per year, I’ll get an invitation to these events, allowing me a chance to hear directly from Bryan about the hottest income investment trends, macro-economic events, and even giving me the chance to ask him my most burning and pertinent questions. V.I.P. Access to Bryan’s 24/7 Members-Only Website — Cash Machine is at my fingertips, 24 hours a day, seven days a week, through Bryan’s private website. Here, I’ll find a complete archive of his weekly updates, monthly issues, and a library of special reports, plus so much more. Now, to get all of these benefits for an entire year, I’d normally pay $249. 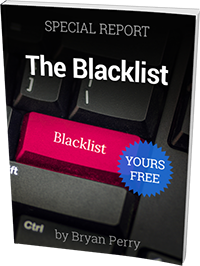 But because I’m acting today I can get a full year of Cash Machine, along with both the Blacklist, Green List and all the benefits of regular membership for the ridiculously low price of just $49.95. 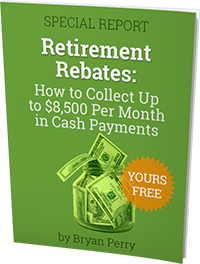 Gift #1: Retirement Rebates: Collect up to $8,500 in Monthly Cash Payments – This special report will introduce me to a special class of high-yielding investments capable of paying out thousands of dollars every year. 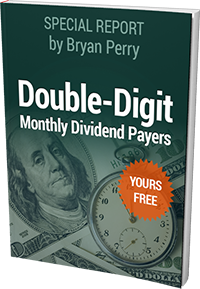 Gift #2: Three Double-Digit Monthly Payers for 2019 – Here I’ll find Bryan’s top three monthly income investments offer either double-digit yields or double-digit total gains each month (on average). They pay out 12 times a year (or more), giving me income I can bank on. Gift #3: Cash Machine Quick Start Guide – Every new member should start with this step-by-step guide for getting the most out of Cash Machine. With this, I’ll hit the ground running. With the 2-year offer, I’ll get these three reports free of charge, the Blacklist, the Green List, all of the other benefits of regular membership, and I’ll get them for two full years for just $89. That’s a full $409 off of the regular 2-year price of $498. You’re entitled to a 100% refund of all money paid within the first 30 days of your subscription. Take a whole 30 days to try out my publication, Cash Machine, my recommendations, my research and my analysis. If you’re not 100% satisfied with your Cash Machine subscription, just let me know within 30 days and I’ll rush you a complete refund, no questions asked. Save even more money with a lifetime subscription to Cash Machine. For just $249 today (*and a small annual maintenance fee of $29), you’ll receive all the benefits that come with a 2-year subscription, including the FREE special reports listed above. On top of that, you’ll also receive every single special report Bryan Perry has or will ever write. All of these benefits are yours for as long as Bryan publishes Cash Machine. It’s the absolute best deal we offer, the most bang for the buck… and you can pass on this membership to your children. Take us up to access ALL of Bryan’s special reports. Look everything over for 30 days and, if you decide it’s not for you, just let us know. We’ll refund 100% of your money. No questions asked. All the issues and special reports are yours to keep for FREE. And this really is a no-brainer decision. Here’s my information below. Let’s get started!